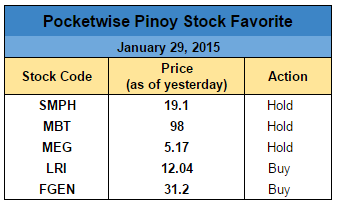 Updates on our Pocketwise Pinoy Stock Favorites! Some of you might have just started investing in stock market and have no clue on what stocks you should buy. I thought of sharing to you some of the stocks I am investing in and what are the current actions I am taking. LRI and FGEN are still in the BUY status but SMPH, MBT and MEG is on HOLD since they are above our Truly Rich Club buying price, If the prices go up and hit our target price, then it's selling time for SMPH, MBT and MEG! But if it goes down, then we can buy them again. For those who followed our PwP Stock Favorite update last year, you could have bought SMPH, MBT and MEG at around 15.5, 87.6, and 4.50 , respectively. The lowest profit you could have gotten is 11% in 6 months if you sell your shares at the price indicated in our PwP Stock Favorite table. 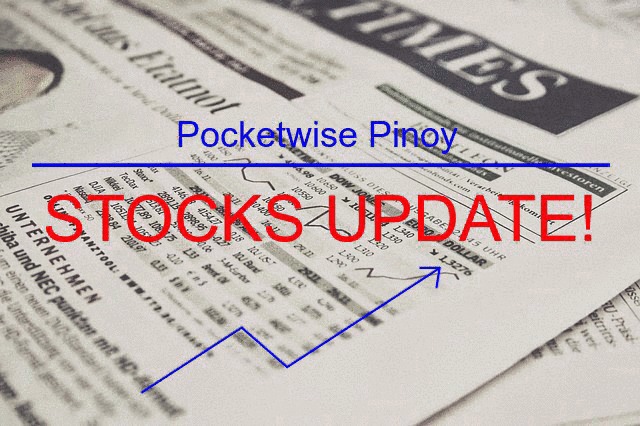 Want to receive our Pocketwise Pinoy Stock Favorite updates? Just fill out this form so we can include you in our list. I want to receive PwP Stock Favorite Updates! P.S. Please take note that the table above shows the stocks I am investing in and the action I am taking based on the current market price. It does not guarantee anything but this is just to give you an idea on what stocks I am investing in as a long term investor and if I am currently buying, selling or holding my shares. For more details on what companies are good to invest in and to get monthly updates (or as often as possible), visit the Truly Rich Club page. The club provides suggested stocks as well as the buying or selling price for each stock. Want to get your free Stock Market e-book?